The EVS 1500,EVS 1500LF/ EVS 8, EVS 8KLF / EVS 10K, EVS 10KLF are the new versions of the MULTI AWARD WINNING EVS 7000/ 9000 Range redesigned having taken cognisance of extensive feedback from our distributors and customers worldwide. The New range of EVS systems have been extensively redesigned and upgraded with many of the requests and suggestions coming direct from feedback from all worldwide customer base. Each machine has a lead and Lead Free Version. Complete with Top extraction to maximize the extraction of gas and smoke, new chassis with separated control section and pull out drawer for the power, and separated control and pneumatics sections + out side view of air pressure. New Four wheeled highly manoeuvrable cart, pull out drawers for both stand alone filter and dross bucket to facilitate easy change out of filters and bucket replacement. Redesigned Standard Stand Alone Filter with warning lights and buzzer also with bigger more flexible hoses and High flow Combination filter that replaces the first three filters in the filter stack [four filters down to two] reducing filter change out by up to 90+% and therefore maintaining the airflow over the same extended time scale. EVS has designed a new HS high solids filter system with warning lights and buzzer. 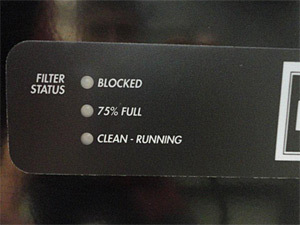 This new HS filter system is capable of handing any of the high solids fluxes on the market. 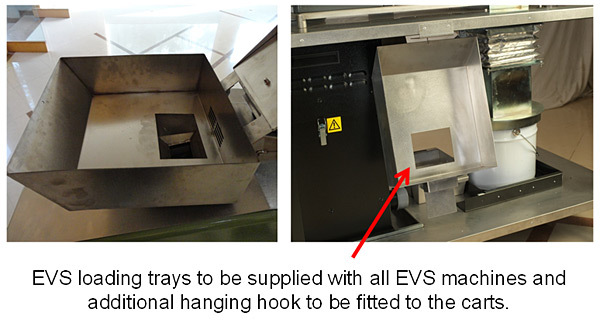 EVS has developed a new clip on/off loading tray that clips in to the fume extraction port. This increases the size of the loading area and also has fume extraction whilst the operator is loading the EVS system. 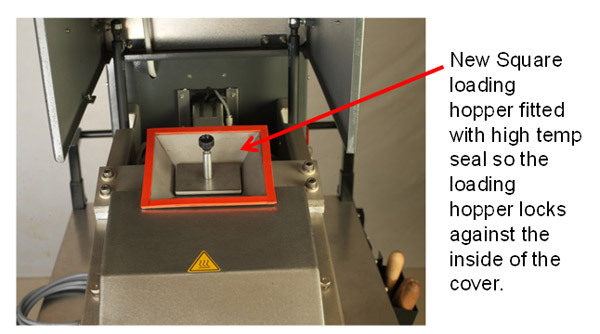 New Larger Square hopper loading hole giving larger loading area plus new redesigned hopper plug. 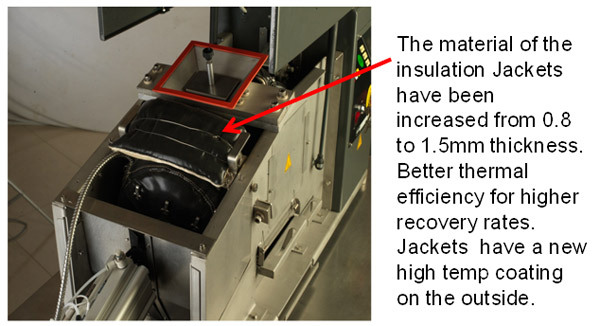 EVS has also upgraded the Heater insulation jacket and sealed all the side and front and rear of the machine. This keeps any dross dust or fumes totally inside the machine during operation. 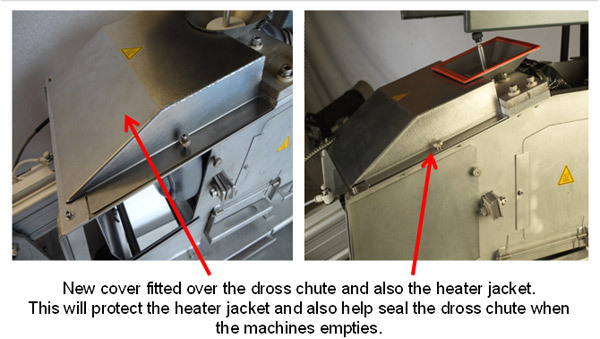 New Dross chute cover protects the machine and jacket during operation. The new pull out tray for the solder ingot tray and also the new solder ingot trays have a handle at each end. Upgraded Software to improve control and service prompts. Pull out tray for filter box and dross bin and new handle for the front of the cart to help with moving the EVS Systems from wave to wave. 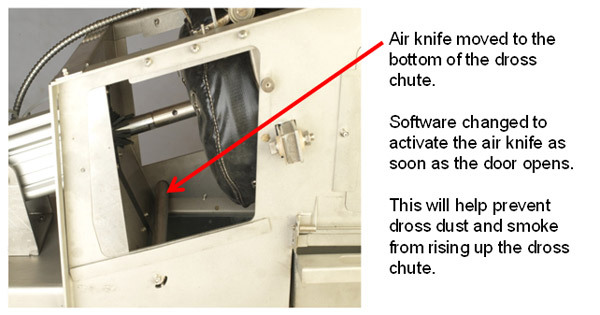 Air knife for dross chute. All electronics moved to rear sealed section of the machine for ease of service access. Redesigned dross handling chutes with pull out drawer for the dross buckets/bin. 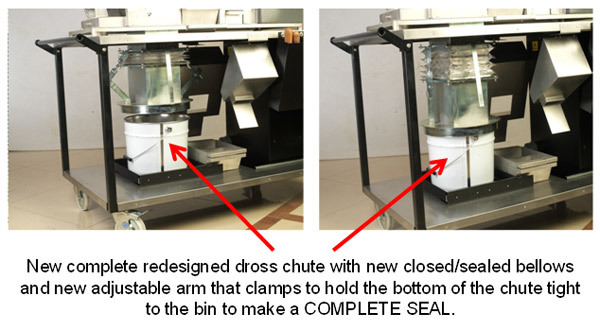 The new designed chute has a new double rind bottom and clamping system with sealed bellows. This totally seals the dross chute to the bin. The EVS is fully lead free compatible now. 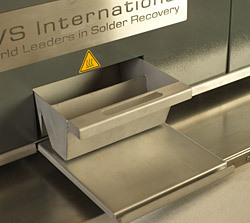 The EVS creates huge savings as it will recover a minimum of 50% of pure solder from all the dross currently being sent away. The EVS means much less storage and handling of dross = Freed-up space and reducing costs. The EVS means substantially less heavy lifting for staff, the heavy pure solder is retained by you = A happier, healthier staff. The EVS makes a positive contribution to gaining and retaining ISO 14001 accreditation RECYLE- REDUSE-REUSE = A happier, healthier environment and future. 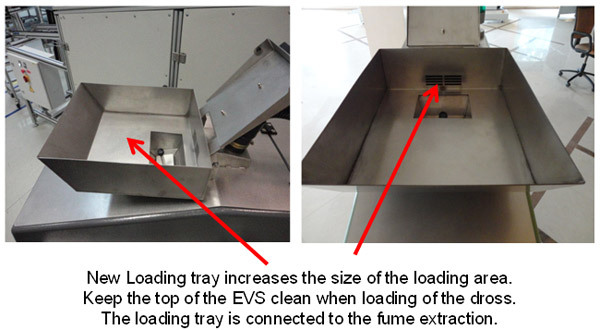 The EVS speeds up the dedrossing process by up to 70%, less squeezing and no chopping without financial penalties. The solder is retained by you. Staff are empowered by contributing to site savings and environmental improvements. The EVS presents a rare opportunity to environmentally improve your factory while at the same time providing a substantial positive payback and improving your soldering process.